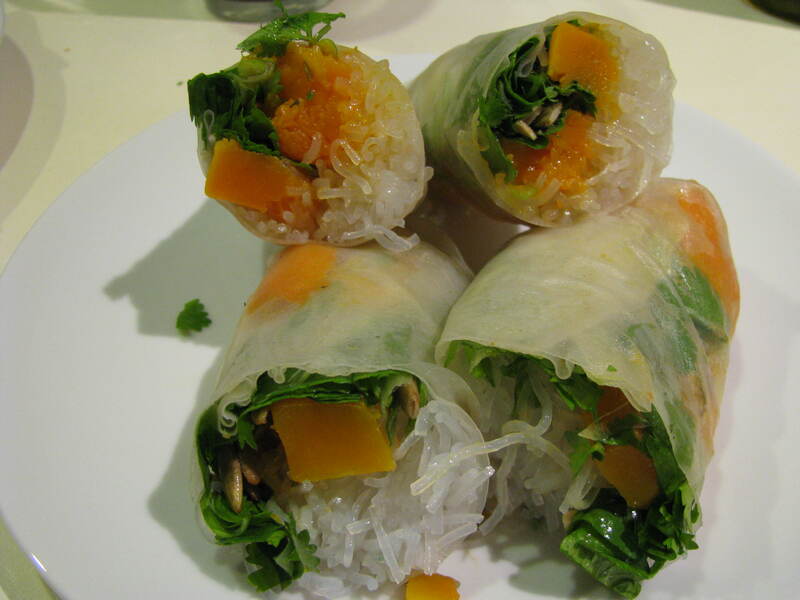 I finally made the Veganomicon butternut squash and pumpkin seed rice paper rolls that I have been thinking about for the last two months. My last (and first) attempt at summer rolls were back at the beginning of August. I am a huge butternut squash fan, so I had a strong predilection for these ones, but I tested them on two friends and they were both equally sold. They take a little while to assemble, but are fun to make, keep for a couple of days if you wrap them in wet paper towels and make a great packed lunch. They said you could also use Thai basil in addition or instead of the cilantro. I adapted the recipe a little and definitely used more squash than they suggested as well as adding some julienned scallions and a little sesame oil to the noodles. I also used cellophane noodles (which are made from mung bean starch) instead of rice noodles. They said to chop the pumpkin seeds and I just left them whole. You can cook the squash and noodles in advance and keep them in the fridge. I ended cooking them the day before and then assembled the rolls the following day. I usually think of squash hot, baked in wintry dishes, but it was delicious cold. The Veganomicon dipping sauce was soy sauce, rice vinegar, hot chile oil, sesame oil and sugar but I would probably experiment with a different dipping sauce next time as I wasn’t completely wowed by it. They have another dipping sauce recipe with cranberries, serrano chiles and lime juice that sounds good, so maybe I’ll try that next time.